Wedding Desserts - Now....you're cooking! 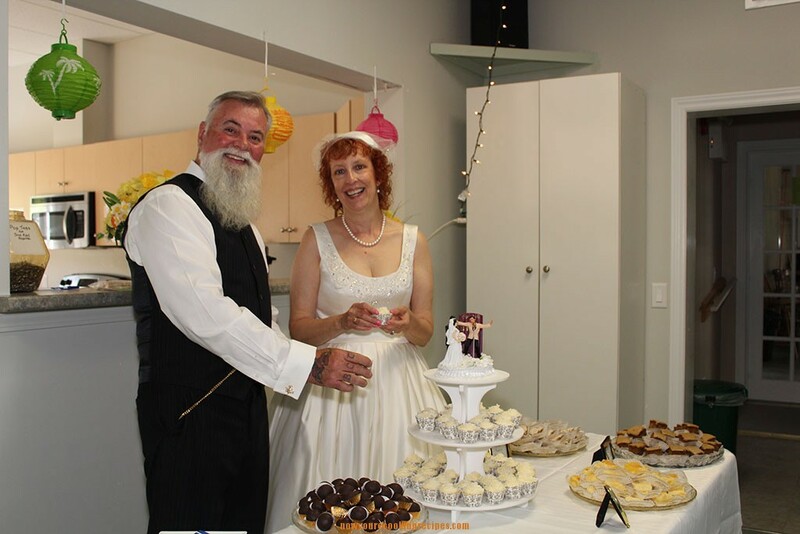 We had our wedding dinner catered by Valleyfarm Market, and they did a terrific job. They set their barbecue up outside the hall and did barbecued boneless chicken breasts. Also on the menu were baked potatoes, coleslaw, Greek pasta salad, and rolls. But because I am a baker, I wanted to make my own desserts. Because we were going to the lake and only coming home a few days before the wedding, I made everything ahead of time and froze it. I had to do a couple of trials of new recipes I wanted to make, to make sure they turned out okay and froze okay too. John enjoyed this “research and development”! Because I am the queen of comfort food, of course the desserts had to be “homey”. I wanted to honor my Mom and Grandma who are no longer with us, and I made my Mom’s signature Boiled Raisin Cake, and Grandma’s ever popular Butter Balls. A favorite of mine in Coconut Balls, and to round it out I chose 2 new recipes: Raspberry Meringue Bars and Lemon Cheesecake Bars. Raspberry Meringue Bars – (off site recipe) I made this recipe as written, using President’s Choice Seedless Raspberry Jam, and they turned out great, very tasty. They are similar to some of the squares recipes I have here on the site, but it made a large 10 x 15 pan. White Wedding Cupcakes – (off site recipe) in my web research, I kept coming across this recipe. I had never bought a cake mix before – although we did use them from time to time at home when I was a kid, but this recipe looked really good, so I decided to give it a try. I made the recipe as written, and baked in mini-cupcake tins. I think it took about 10-12 minutes to bake.